On the way out of Shrek the Third, I discussed my feelings that this was a very mediocre film with my Dad. He suggested that I was possibly becoming too old to enjoy movies like this, but I couldn’t disagree more. Shrek the First is a film that I enjoy watching as much now as I do when I was nine. I’m first in line to see all the Pixar films (Toy Story, Finding Nemo, Cars, etc.) and I’ve loved them all. I love getting my hands on a new Special Edition DVD of an old Disney movie, and watching it, reliving childhood memories. These films are all considered “kids” films, but I, a teenager, love watching them. Why? Because when you get down to it, they’re made for all ages. I can watch them now and remember what I loved about them as a kid, and then see new layers in the film that I hadn’t known as a kid. The first two Shrek films had these layers, all the Pixar films have them, and any Disney movie made prior to 1995 has them. The animation industry is nothing but a way to make a quick buck nowadays, and sadly, the beloved Shrek franchise has been caught in this web. There were 11 CGI films in 2006, and I only enjoyed two of them. There are plenty this year too, and I was expecting to enjoy this one. But Shrek the Third is sadly, a Shrek too many. It’s not a bad film, but it isn’t really a good one either. It’s right there in the middle. The film’s main problem is that is just uninspired on almost all fronts. The acting, the music, the screenplay, the jokes, etc. The plot is strong enough, and when I heard about it, I was very excited. The plot is that while Shrek goes off to find a new king for Far Far Away, Prince Charming stages a rebellion with all the fairy tale villains. I expected Prince Charming’s rebellion to be on par with the first Shrek; it’s a story about fairy tale creatures, but from the other side, like the first film. This time, it’s the villains. Indeed, the first scene in the film with all the villains on screen is on the same level as the original Shrek; re-imagining classic fairy tales with a delightful twist. Sadly, after this scene, the plot is just underused and lazily constructed. I can’t say I was jumping out of my seat with excitement when I heard the plot about Shrek going to find a new King (Arthur, to be precise) but this plot is even lazier then Charming’s plot. Arthur is the nerdy kid in school (how many times has that been done?) and Shrek has to do a whole lot of convincing to get him to be king (once again, a story done in a zillion films). Luckily, the returning characters of Donkey, Puss in Boots, Gingerbread Man, Pinocchio, The Three Pigs and the Cross-Dressing wolf salvage much of the film from being truly bad to being almost really good. Donkey and Puss in Boots are always laugh out loud funny, as are their fairy-tale friends, but they are drastically underused. Whenever they were on screen was a fun time, but when they were off it (which they were far too much) the film was just boring. One of the big problems, aside from under-using the villain plot, was the two main characters, Shrek and Fiona. They didn’t have one joke in the whole movie (any that were good, anyway) and were very serious the whole film. Every time they had a line, it interrupted the humor, and I was saying to myself “Oh, get off the screen you negative Nancy’s.” They were no fun this time around, which was really disappointing. Another big problem was the casting of Justin Timberlake as King Arthur. Winner of numerous Grammies last year, and having established himself as a very popular country music star, I would think that Justin knows his way around a recording studio. He probably does, but you wouldn’t know it from Shrek the Third. Seriously, he’s monotone, boring, and downright cheesy in most scenes. If you want to get a voice actor to do a good job, show them Timberlake’s performance in this film, and then tell them not to do what they’ve just seen. It would probably work miracles. 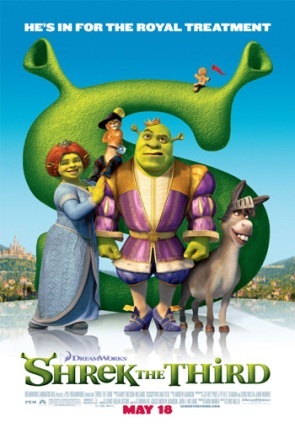 Smaller flaws in this film include the increasing trend in this series to simply take the modern day world and stick it in the Shrek universe. Funny, right? God no. It’s the most overused idea in family films today, and it’s just lame this time around. When Shrek goes to Arthur’s high school, this “modern day in the past idea” is put into use heavily, and I found myself checking the popcorn to see if I could skip the scene to get a refill. Sadly, I wasn’t out of popcorn. They could have been so much more creative here; why weren’t they? But this film isn’t all bad, by any means. Like I said, anytime Shrek and Puss are hamming it up is great fun, and there are some moments where you’ll lose breath laughing. There are still some references to movies and shows from the parent’s era, but not nearly enough to get anyone over 10 riveted. The film’s absolute biggest problem is that it was made with almost no one but kids in mind, which brings me back to my opening remarks. The classic kids films are classics because they have multiple layers. On the front, there’s the simple plot and the simple jokes that kids love. Beneath this, there are deeper elements to the plot and more in-jokes that parents will get. With Shrek the Third, what you see is what you get, and that’s a movie for kids. Parents, make sure you’re very awake when seeing this; it’s only riveting for the little ones. The gross humor goes about six miles overboard this time, which is the main thing that excludes anyone over ten. The sophisticated humor is only seen a few times, and while Donkey and Puss’s sight gags and one-liners are great, they’re often overshadowed by things like Shrek drowning in baby-puke. I think its time to retire this franchise, to leave it as both a fond memory (Shrek 1) and a fun side dish (Shrek 2) with an underwhelming but somewhat satisfying dessert (Shrek the Third). The first Shrek was made so people could experience a good movie, and Shrek 2 was made for that reason, and to make a whole lot of money. Shrek the Third is made so DreamWorks can start building their restrooms out of solid gold, and you can tell. Making a movie solely for money is never a good reason to make a movie, because what you’ll be left with is something that, while often fun, is overall empty and shallow. Shrek the Third is a very good example of this.